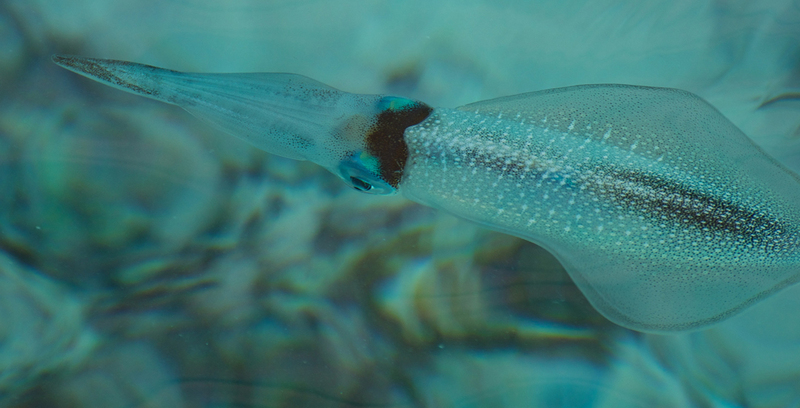 By understanding how squid and similar marine creatures disguise themselves, scientists hope to produce new camouflage materials. (ISNS) -- As an octopus, a squid, or a cuttlefish moves around a reef in the ocean, it instantly camouflages itself against the background. Known as cephalopods, these animals have the extraordinary ability to conceal themselves from predators by adjusting their skin to take on the colors, shapes and patterns of their local environment. A research collaboration among three institutions is now trying to understand how they do it. In the process, the team hopes to find ways to develop materials for use by humans that emulate cephalopods' skills at camouflage and signaling. "Our internal name for this project is ‘squid skin,' but it is really about fundamental research," said Naomi Halas, a materials scientist and nanotechnologist at Rice University in Houston, Texas. "Our deliverable is knowledge -- the basic discoveries that will allow us to make materials that are observant, adaptive, and responsive to their environment." The Office of Naval Research is backing the effort with a four-year, $6 million grant. "The Navy is interested in basic science that will help make breakthroughs of specific benefit to the Navy," explained Roger Hanlon, an animal behavior specialist at the Marine Biological Laboratory in Woods Hole, Mass. The project will focus on proteins called opsins. These usually function in the eyes to sense light. In 2008, however, a team headed by Hanlon found that the skin of cephalopods also contains opsins. Project scientists from the Mass. lab, Rice, and the University of Maryland, Baltimore County are now studying how the opsins in the skin receive light and help the sea creatures adjust their skin patterns. "Cephalopods can change color, texture and shape in fractions of a second, so they seem like they would be an excellent model group to study," said James Wood, a marine biologist at the Waikiki Aquarium in Hawaii, who is not involved in the project. "And Dr. Hanlon's work is well established in the cephalopod community,"
Why do cephalopods need camouflage? First, they have plenty of enemies in the ocean. "You use squid for bait because almost everything eats squid," Hanlon noted. Project member Thomas Cronin -- an expert on opsins -- said that cephalopods have virtually no natural chemical defenses. "One of their major ways of defending themselves is to look like something they're not," said Cronin. They do that very effectively. "If you look at an octopus or cuttlefish moving around a reef, it instantly camouflages itself against the background," Hanlon explained. "Within one to two seconds they will have assessed the visual background and will have settled on a pattern to show for camouflage." That speed stems from the fact that cephalopods create their camouflage through their nervous systems. Chameleons, by contrast, use hormones in their blood to change their appearance. That process can take many seconds, minutes, or even hours. The cephalopods' camouflage has another advantage: It matches the color of the background perfectly. That's important because their predators, such as groupers, barracudas and bass, have highly sensitive color vision, much better than that of humans. Intriguingly, the cephalopods themselves don't possess color vision. So how do they overcome color-blindness to achieve their camouflage? The Mass. lab's discovery that cephalopods' skin contained the same opsin as their retinas provided a key clue. This indicated that something in the skin can detect light and respond to it. "The opsins may check the environment cell by cell to see what they're doing, or they may sense color in a way the eyes are not capable to doing," Cronin said. In any case, the find offered a route to mimicking squid skin. "We said: ‘If we're going to make materials that can control color and patterning, we should look at materials that can sense light out in the material and change it out there,'" Hanlon said. In collaboration with Cronin, Hanlon's team will seek different opsins in cephalopods' skin that detect light of different wavelengths. "We will feed information to Naomi Halas' group about how the opsins are constructed in the cephalopods and how to embed sensors in the materials, so that you have some sensing and control in the material in the same way that the animals do," Hanlon said. "The presence of opsin means they have some sort of light sensor embedded in their skin," Halas said. "So the questions we have are: 'What can we, as engineers, learn from the way these animals perceive light and color? Do their brains play a part, or is this totally downloaded into the skin so it's not using animal CPU time?'" The Rice engineers plan to use nanomaterials discovered by team member Stephan Link to create sheets of materials that can see light in the same ways as cephalopods' skin and change color quickly.